Recently my friend Hillary told me about Relay Foods (if you use that link to buy food, you and I both get $30 off), a local-ish food shopping website for Charlottesville, Richmond, DC, and Baltimore. With the $30 off from that discount, I got a variety of things, including some fancy cheeses. 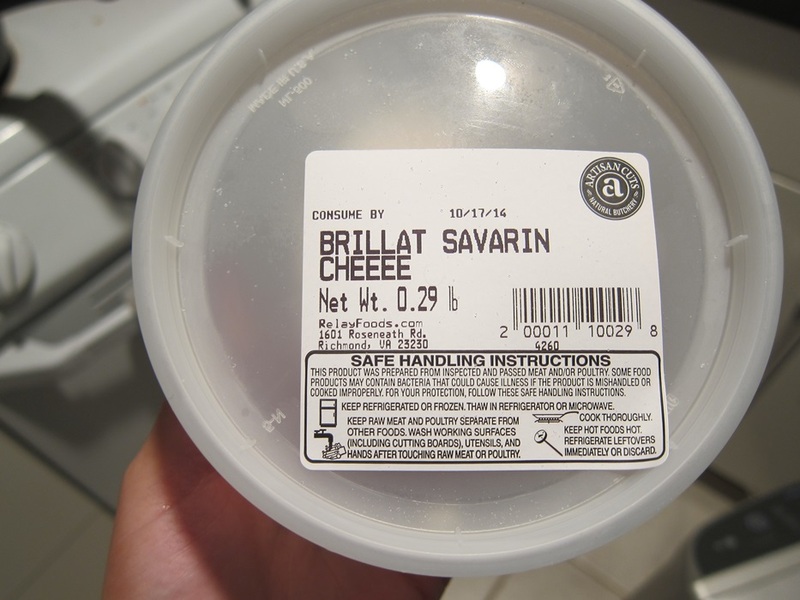 This particular cheese, the Brillat-Savarin Triple Creme Cheese, is a soft white cheese made slightly tangy bit a bit of lemon flavor. It’s really nice! 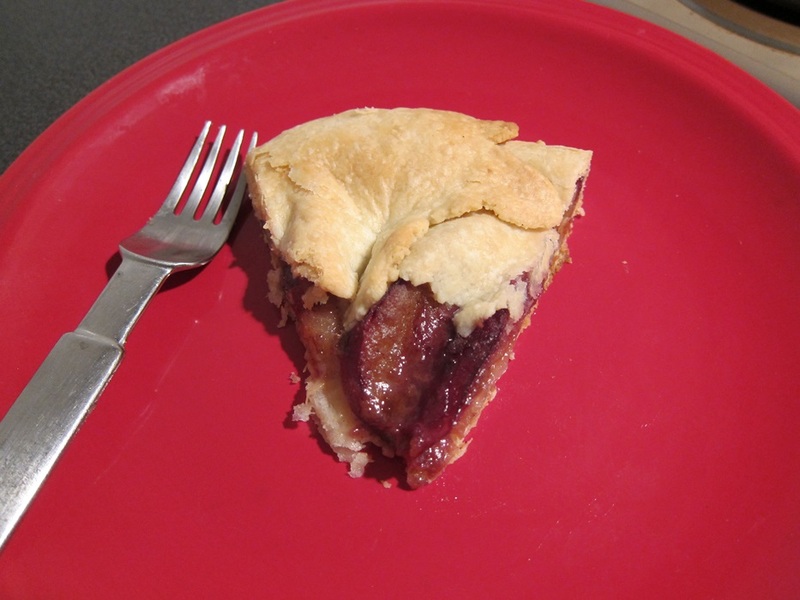 I really like pluots, and get excited every time I see them, so I was relieved when this flavor combo came out as well as hoped – would have hated to have wasted fancy cheese and pluots! 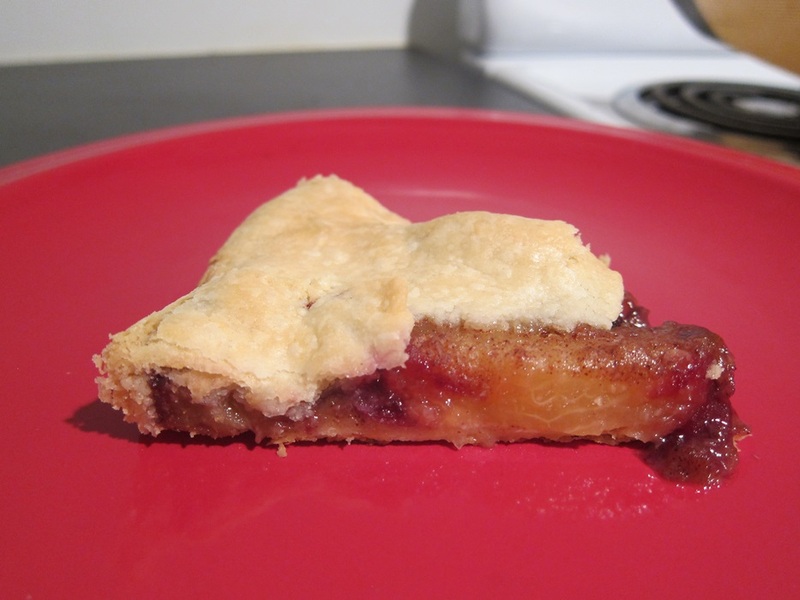 Instead, the flavor is sort of like an amazing plum jam, with everything you love about pie crust. I’m into it! Good news: I ordered a cutting board last night! To prepare the crust, first cut the butter into small cubes. Place the butter and some water in the freezer for 15-20 minutes. 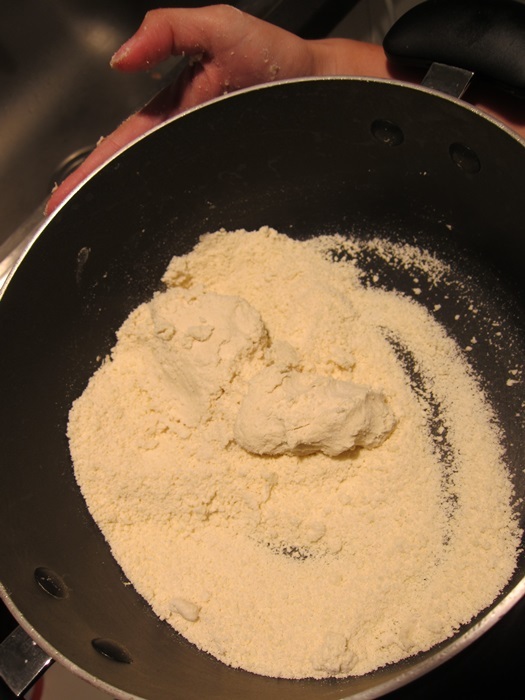 Combine the flour and salt in a food processor, then add your chilled butter. Process for 3 pulses, each of about 3 seconds. Turn the machine to ‘on’ and drizzle in the water, a tablespoon at a time, until the mixture just starts to clump. Turn the food processor off, dump the contents into a bowl, and use your hands to press the dough into a ball. It will seem quite dry, but should stick together. Add any remaining water, if necessary, to help it all stick together. 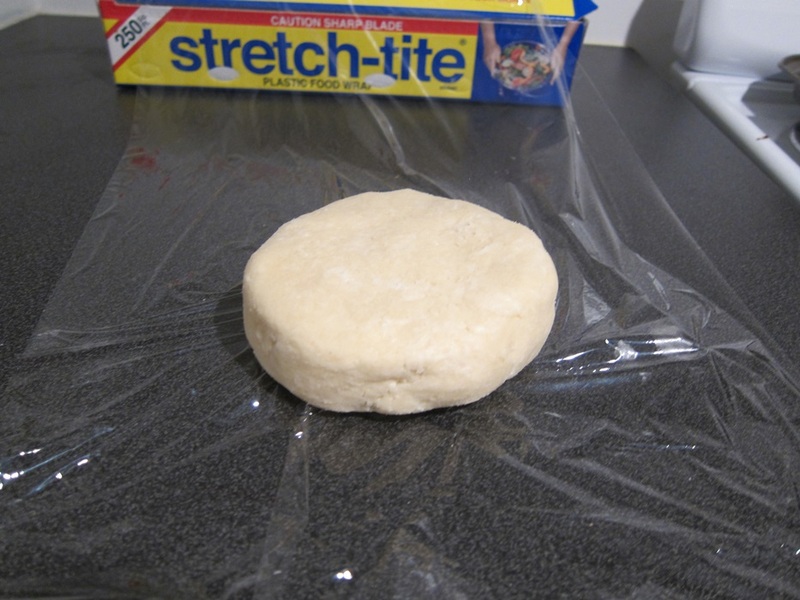 Roll it all into a large ball, then flatten into a disk, rolling the edges along your hand/counter to smooth them out. Wrap in saran wrap and chill at least 30 minutes. Preheat your oven to 375 degrees. Combine the cinnamon, flour, and sugar in a medium bowl. 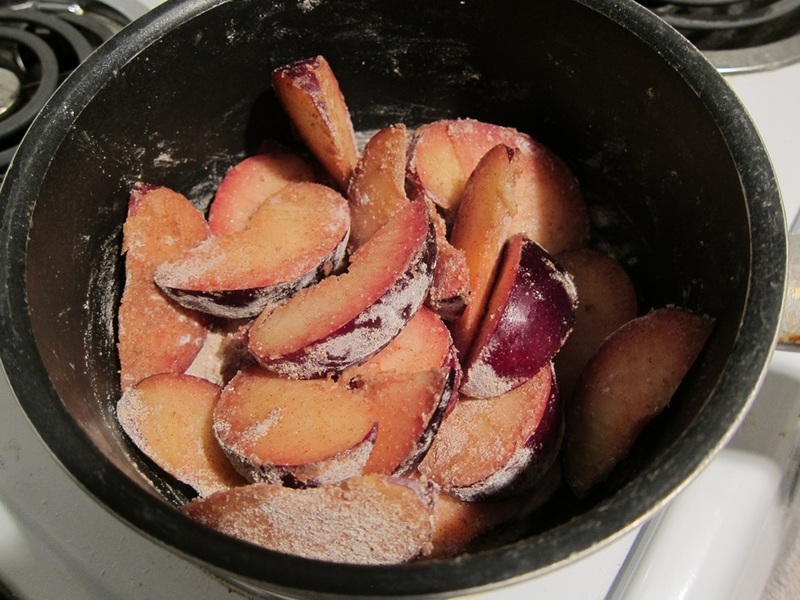 Slice the pluots into thin slices, then stir them into the flour mixture. 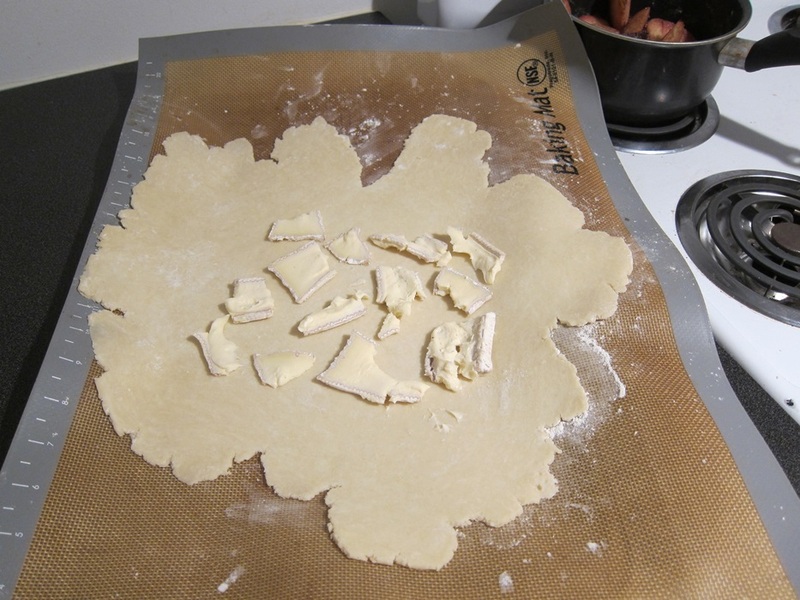 Roll the crust out on parchment paper or a silpat. Slice the cheese as thinly as possible, and spread it around the crust, leaving at least one inch clear around the outside. 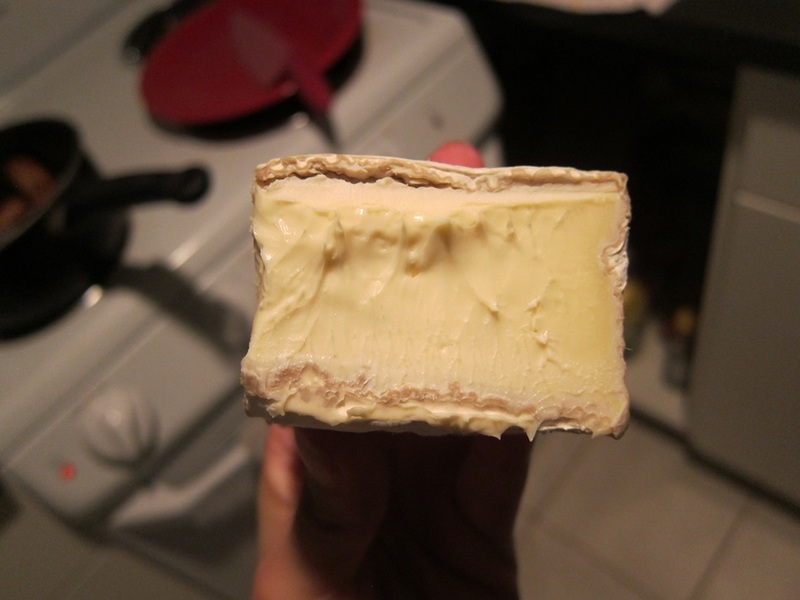 Because it’s a soft cheese, it may clump up when you cut it, but just spread it back out as thinly as possible. The great thing about galettes is you can just shout RUSTIC whenever anyone judges your skills at rolling out an even/round crust! Arrange the fruit slices over the cheese, and spread any remaining flour mixture over the pluots. 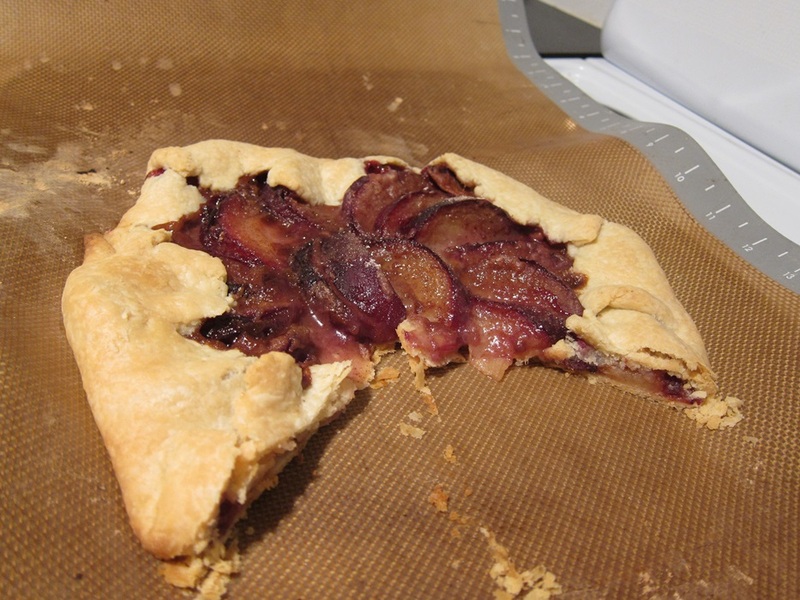 Fold the edges of the crust in, leaving a gap in the center, and press the sides together to hold in place. Bake 35-40 minutes, until the crust is golden brown and the filling is bubbling hot. 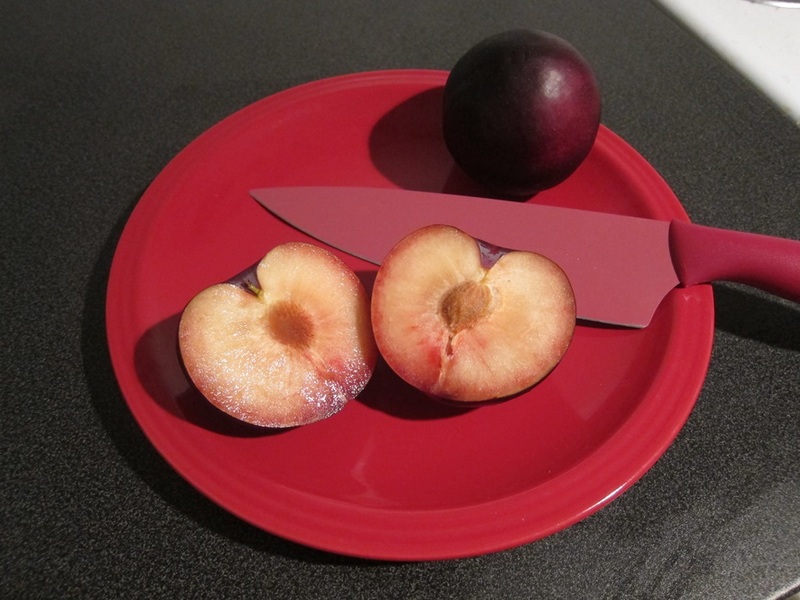 Let cool several minutes before slicing and serving. It’s really nice, and the crust stays crisp enough that you can pick any chilled leftovers up like pizza the next morning evening. Setting a terrible example, as you really shouldn’t cut on a silpat! Combine the flour and salt in a food processor, then add your chilled butter. Process for 3 pulses, each of about 3 seconds. Turn the machine to ‘on’ and drizzle in the water, a tablespoon at a time, until the mixture just starts to clump. Turn the food processor off, dump the contents into a bowl, and use your hands to press the dough into a ball. It will seem quite dry, but should stick together. Add any remaining water, if necessary, to help it all stick together. Roll it all into a large ball, then flatten into a disk, rolling the edges along your hand/counter to smooth them out. Wrap in saran wrap and chill at least 30 minutes. 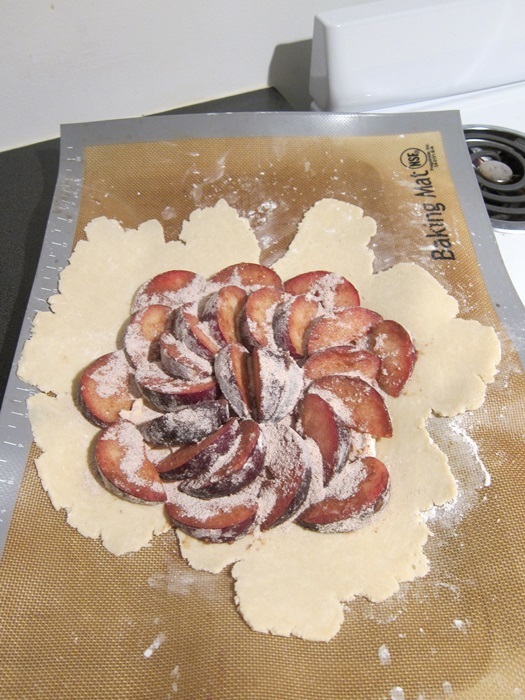 Roll the crust out on parchment paper or a silpat. Slice the cheese as thinly as possible, and spread it around the crust, leaving at least one inch clear around the outside. Arrange the fruit slices over the cheese, and spread any remaining flour mixture over the pluots. 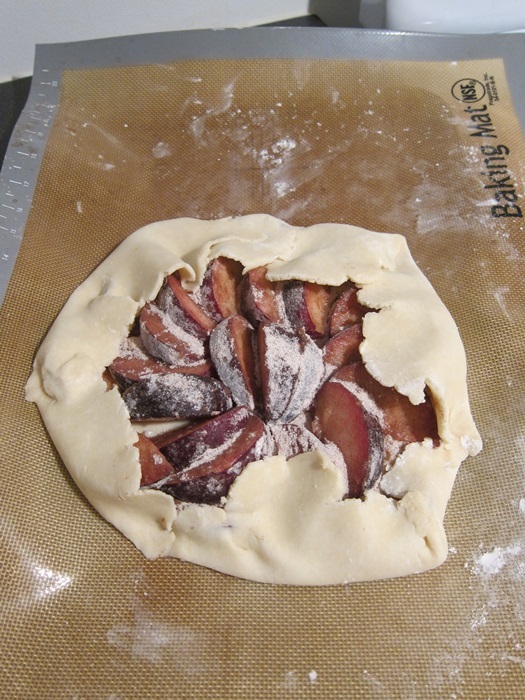 Fold the edges of the crust in, leaving a gap in the center, and press the sides together to hold in place. 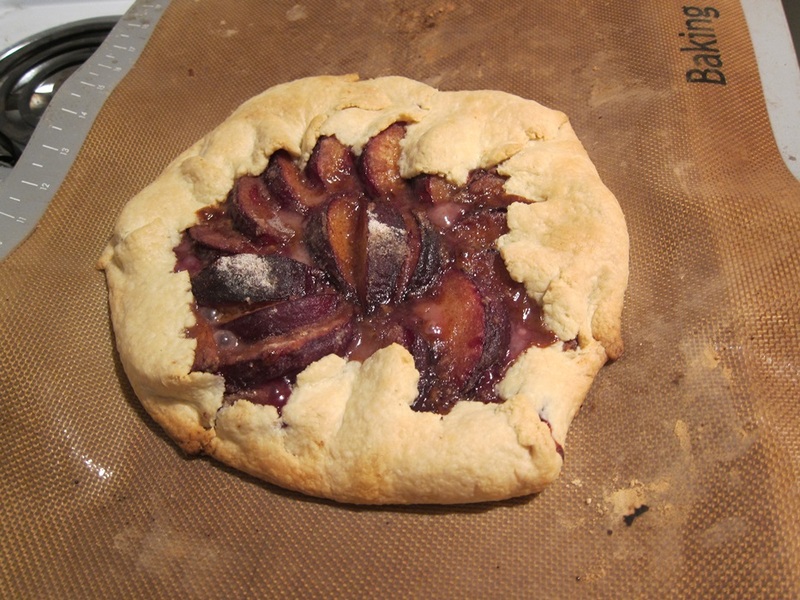 This entry was posted in Dessert and tagged cheese, fruit and cheese, galette, pluots. Bookmark the permalink.